I'm as interested in the environment as most people, maybe a bit more but that's arguable, and I recognize that global warming is a man-made phenomenon and I'm doing my part to care for our planet. If you've been watching television lately you've probably noticed that environmental consciousness is really catching on. It's one thing when the hippies (that includes me) and Al Gore are talking it up, but when T Boone Pickens gets into the act you know there's something to it... not to mention it's profitable. 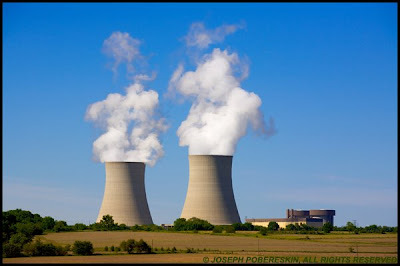 I can usually get up and get a snack during a TV commercial, or skip by them altogether if I've DVRed a program, but when the Repower America campaign (Gore's spots) or the Pickens Plan ads (Pickens' spots) air, I keep my seat and watch anyway. And they're all pushing alternative energy with a fervor that suggests it's almost too late (it may be! ), and they're telling us to build solar panels and wind farms. The part that I really didn't understand was that if we need to build these new power grids from the ground up, if it doesn't yet exist, where'd they get the footage? Well... I'm not as naive as I look, and I want to make pictures for the green revolution but, where are all these things? I know that the area around Palm Springs, California is studded with wind turbines, but I'm not going to Palm Springs. Aren't there any around here? You bet there are. 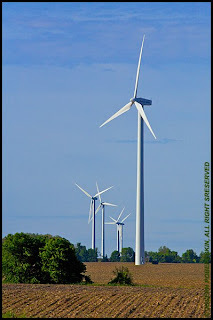 I did a little research using Google Earth and found the local wind farm. Yesterday morning I rolled out of bed at 3:15 AM, checked the sky and decided that it was clear enough to be worth driving two and a half hours to photograph a wind farm, so I hit the road and I was in the wind. While at the wind farm I met a guy who was kind enough to explain the economics of the deal for the farmers who've allowed the turbines to be put on their land. Then he said, and it's clean... not like that!... and he pointed to the horizon north-west of where we were standing. What are we looking at, I asked? Byron? He was pointing to a minuscule puff of smoke on the horizon. It looked insignificant to me, but that's because it was forty miles away (I said it was clear, remember?). 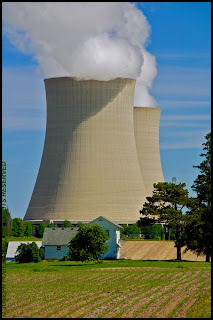 According to my new friend, there's a nuclear power station at Byron and it's mucking-up the landscape. 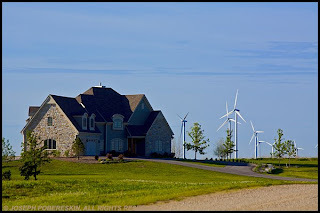 All he wanted to know was, would you rather live here with these clean, quiet, pretty windmills in your back yard, or there, with a reactor and cooling towers in your back yard? Kind of a no-brainer, isn't it?